Last December, while spending the holidays with my parents and sibs, my mom and I came across a bag of black rice at the grocery. I had been curious about this for a long time now so we picked it up. Here’s the thing I understand about my siblings — and many others for that matter: they hate brown rice. In fact, one of the things I don’t like about going to my parents’ is that they either only have white rice or cook only a very small amount of brown rice for my mom. Imagine my surprise when the helpers cooked this and suddenly, my mom was not the only person who became my kaagaw. My siblings *gasp* ate the black rice! 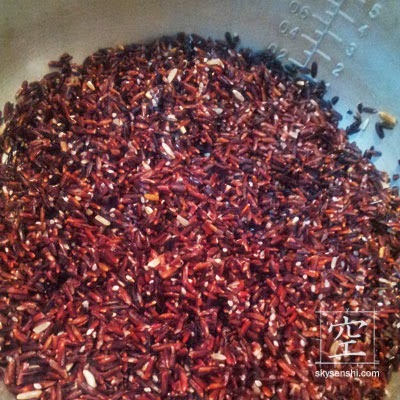 When it comes to nutritional value, black rice beats brown rice. According to the label, it has the highest protein content (compared to white and brown) AND twice the fiber. 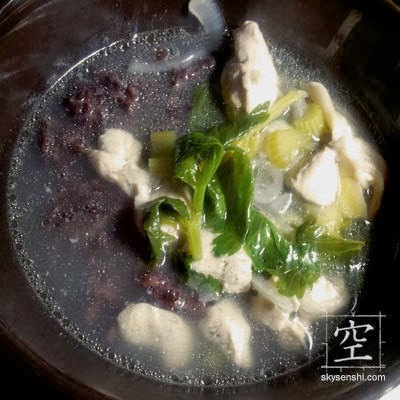 It is rich in anthocyanin, an antioxidant that fights cancer and heart diseases. I also did a few quick searches and found out that this has low glycemic index of 55 compared to white rice’s 87. This simply means that it will burn slower than white rice, which will keep you full while maintaining the calorie intake. It’s pretty heavy so I eat very little of it and it takes a while before I go hungry again (unlike with white rice, which makes me hungry every 2 hours). The boyfriend, who loathes brown rice so much, actually loves the smell and taste of black rice. So it looks like this will be our staple food now. I also tried it with some chicken soup when I was feeling under the weather. This particular brand is Jordan Farms. You can read instructions for cooking at the back of the pack, but it’s pretty much like cooking brown rice: soak for 30 minutes to overnight before cooking. The measurements are: 1 cup of rice = 2.5 cups of water. I use just 2 cups of water, though. It still turns out ok. When I asked the boyfriend to describe the taste of brown rice, he gave me this really weird answer: “It’s like champorado without the chocolate flavor.” What does that even mean??? I don't think they sell that here! Success na rin yung ma-sway ko si Chris na kumain ng Brown kesa White. :)) Actually, Success ay napapakain ko siya ng brown rice halos araw-araw. HAHA. Naku, si boyfriend pag brown rice reklamo ng reklamo. Bumalik na raw sa white rice etc. Eh hindi mo talaga ako mapapakain ng white rice na. 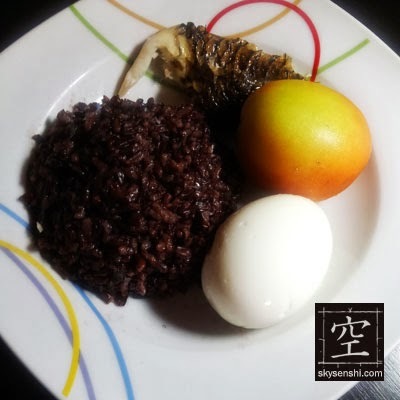 Pero gustong gusto niya ang amoy ng black rice. So yay! Hay I can't make my kids eat any other rice except white. Despair ko yan sa boyfriend ko. 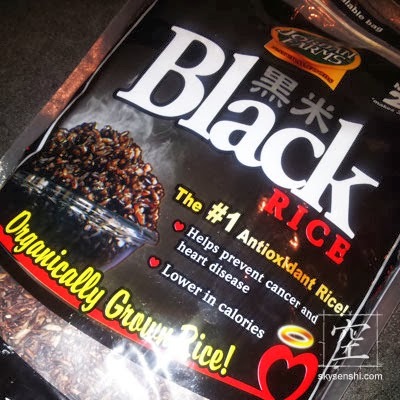 Buti nalang gusto niya amoy and hitsura ng black rice. I was also shocked that my sibs (who absolutely hate brown rice) ate it.